How is that Cosmic Rays turned Ben Grimm into the Thing? And why is his ability to revert to his normal form more conditional than his teammates? This document looks to explain how and why Ben changes forms by examining the times that he has. This is not a listing of Ben's transformations, rather, it is an analysis of them. Ben's initial transformation in Fantastic Four #1 was the result of bombardment with Cosmic Rays. Later analysis by Reed Richards showed increased levels or solar flare and neutron activity, but it is unclear exactly how those additional factors contributed to the Thing's fate. That the Cosmic Rays were primarily at fault, though, seems unquestionable since subsequent changes in the amount of Cosmic Radiation in Ben's body have forced him to undergo additional changes. There have been two types of changes the Ben has undergone when subjected to additional Cosmic Radiation. First, and most frequent, is reverting to human form. Initially it may seem unusual that additional doses of radiation would have a negating effect on Ben's condition, but this author theorizes that Cosmic Rays can have either a positive or negative charge, perhaps partially dependent on the aforementioned solar flares. A positively charged bath of Cosmic Rays could conceivably counteract the effects of negatively charged radiation, and vice-versa. This would further explain how all four members of the Fantastic Four were de-powered in a battle with the Frightful Four. 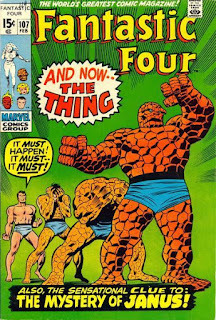 (Fantastic Four #38) Although it may be noted that there have been occasions where the entire team was bathed simultaneously with only an effect seen on Ben, it should be pointed out that a) the effect was temporary, b) none of the other members exhibited their powers during that time either, and c) the transformation was imperceptible to those experiencing it. The second change Ben has experienced when absorbing additional radiation is further mutation, noticeable by an unusually craggy, almost stalactite appearance. This second change has occurred twice (Thing #36, Fantastic Four #310) but the mutation process was radically different each time. It first occurred very gradually and painfully, but faded away with time. The second instance was decidedly quicker and the effect only passed with the help of one Reed's inventions. Although no explanation was given for the first instance, it seems likely that Ben had been exposed to continuous, albeit low, levels of similarly-charged radiation for an extended period. This is also a reasonable guess, considering that he spent most of his time just prior to that change on the West Coast, which has a dramatically different climate than his normal base of operations in New York City, again pointing to the possibility of solar intervention. As a curious side note, Modok may have also stumbled onto a similar source of radiation. His Virus X began changing Ben's appearance as well and, had it's effects not been arrested by the efforts of Mr. 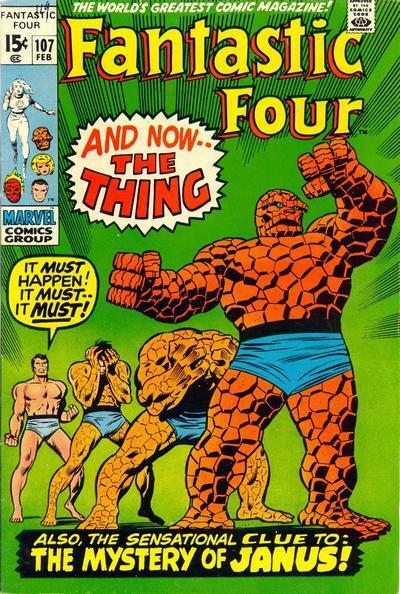 Fantastic and Giant-Man (Marvel Two-In-One #82), he may have ended with a similar craggy appearance. Reed's initial attempts to cure Ben were chemical in nature. He experimented with a variety of serums that were actually successful in returning Ben to human form for brief periods. Not surprisingly, the chemical treatments were inadequate to the full-body transformation Ben underwent. Even the alchemic mastermind Diablo was unsuccessful in completely curing Ben. (Fantastic Four #30) The processes were unstable at best and sudden power surges prompted Ben's cell structure to return to it's rock-like state. Given the origins of Ben's latest bout with humanity (Fantastic Four volume 3 #39) it is surmised that a similar power surge would revert him to the Thing permanently. It should be noted here that Ben was once transformed to his human state when struck by a bolt of lightning. (Fantastic Four #9) As lightning usually carries a negative charge, this author suggests further that the Fantastic Four were in fact bombarded with positively charged Cosmic Radiation. That would account for the lightning being attracted to Ben in the first place (the bolt should have struck Namor under normal circumstances, as he is the taller of the two heroes) and would also explain how the irradiated cells in Ben's body shifted polarity for only a brief time (acting much like a magnet when held next a piece of iron). Eventually, Reed went beyond chemical treatments in an attempt to dissipate the radiation in the Thing's body, once he had isolated the exact wavelengths of it. This method has, in fact, been proven to work in the years since Reed first began using it; however, Ben had come to the conclusion that his girlfriend, Alicia Masters, only loved him as the Thing and not as Ben Grimm. Reed's attempts during this time were subconsciously thwarted by Benjamin himself. Using the same apparatus later -- after having emotionally divorced himself from Alicia Masters -- proved entirely successful, and it was later Ben's willing choice to re-submit his body to additional doses of positively charged Cosmic Radiation in an effort to regain his rocky hide. Cosmic Radiation, however, cannot account for all of the transformations Ben has undergone. On several occasions, other forms of radiation have a negating effect on Ben's condition. Prolonged exposure to Gamma Radiation, for example, seems to have a nullifying effect on the Cosmic Radiation, suggesting that Gamma Rays are very similar to negatively charged Cosmic Rays, the polar opposite of those that first affected the Fantastic Four. Other energies -- notably Korgon's "darkfield illumination" (Fantastic Four #224-225) and the ubiquitously named "metamorphic rays" (Fantastic Four #404-405) -- have been used on occasion to return Ben to his human state, but these have not been studied to any great extent. Ben's changes have, in fact, been surprisingly consistent and predictable. His current status of being able to alter forms at will strikes this author as temporary, and subject to not receiving a substantial shock to his system -- a rather common occurrence for super-powered heroes. Undoubtably, Reed will continue to run tests and make analyses, and it seems likely that the subject will be continued to be explored in greater detail in the future.